Big changes are looming in the out-of-home sector when the winner of the lucrative TfL Tube advertising contract is announced next week, Gideon Spanier writes. For some in the outdoor ad industry, it looks like a battle between David and Goliath. Next week, Exterion Media and its bigger rival JCDecaux will learn who has won the most valuable out-of-home contract in Europe – the estimated £1 billion, eight-year deal to handle advertising on the Tube. Transport for London’s board meets on 17 March and a decision is expected on that afternoon after stock markets have closed. The outcome is likely to transform outdoor advertising in Britain and beyond by triggering a wave of consolidation, regardless of who wins. Exterion is the incumbent and, according to some observers, that gives it an advantage because TfL has put a premium on the operational logistics and technical aspects of the Tube tender. The London Underground cannot afford for its trains to suffer delays as a result of overrunning work carried out by its advertising contractor. TfL’s demands are thought to be one of the reasons why Clear Channel, the third of the big three media owners in UK outdoor, chose to withdraw from the race. Profit margins are also likely to be thin, judging by the decision of CBS Outdoor (as Exterion Media was previously known) to sue TfL midway through the last contract, although they settled amicably in 2012. The new deal is more ambitious than before. It brings together the Tube, the London Overground and Crossrail for the first time, and TfL is keen to maximise the ad revenue for reinvestment. "This venture has no commercial ceiling. It can grow to unprecedented levels," TfL said in its tender, noting that it last came up for renewal in 2006, when "there was no iPhone" and "Facebook was for students". Sticking with Exterion would arguably be less risky because of its track record. Some of its team worked at the London Underground when it handled outdoor internally. However, JCDecaux brings experience from other city rail networks, including Paris, Vienna and Guangzhou in China. The Tube generates an estimated £150 million a year in ad revenues, and Exterion is likely to see less than half of this total. That could make it worth about 10 per cent of the group’s turnover of £500 million across western Europe, according to industry estimates and the accounts of its UK parent company, which is owned by Platinum Equity. JCDecaux is four timesbigger than Exterion, with a global turnover of €3.21 billion (£2.49 billion). It means the French family-backed business has deeper pockets and a longer-term outlook if it wants to compete on price. What’s more, JCDecaux is eager to consolidate its position as the world’s biggest outdoor advertising company. It snatched TfL’s bus-shelter contract from Clear Channel last year and this week began what it claims is "the world’s largest out-of-home digital street furniture roll-out", with the launch of 1,000 digital advertising screens on London bus shelters. JCDecaux could argue that if it has both the Tube and bus shelters, it can sell them as a single "London audience" for TfL, rather than have rival assets competing with each other. The Tube is the jewel of UK outdoor. At £150 million a year, it represents about 15 per cent of annual outdoor ad revenues in the UK – and some think it could generate as much as £250 million a year by the end of the eight-year contract. More digital screens, increasing use of passenger data and Wi-Fi on Tube platforms could drive revenue. London’s status as a super-capital has also increased in the past decade and its population is growing, making "the London audience" even more attractive to advertisers. So the stakes are high – and not just for Exterion and JCDecaux. The private-equity owners of Clear Channel and its smaller rival Primesight, as well as the investors behind another player, Outdoor Plus, are watching because TfL’s decision will affect them. Success for Exterion is unlikely to mean the status quo continues. Platinum will be in a strong position to sell or to take over a rival. A win for JCDecaux would create a real Goliath with close to half of the UK outdoor market and well in excess of 50 per cent of London. Then Exterion would be likely to merge with a rival. Clear Channel and Primesight would also need scale. Thomas H Lee and Bain Capital, the owners of Clear Channel, are thought to be keen to sell or restructure after running the company for eight years. But it might need new investors to lead consolidation across the sector if none of the existing players can afford it. The prospect of an enlarged JCDecaux has raised fears. The company did not win friends when it pulled out of the UK industry’s trade body, Outsmart, last year and some think it could use its position to challenge the power of specialist outdoor buying agencies. 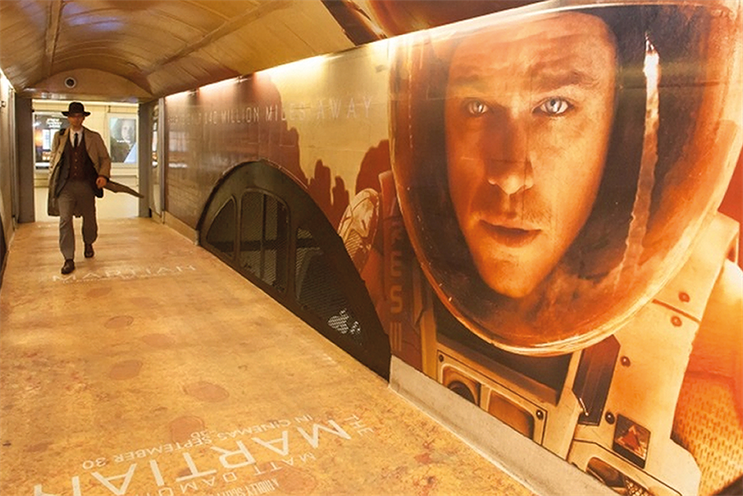 But it is not certain that regulators would seek to curb JCDecaux’s scale if it won the Tube. Global Radio takes more than 50 per cent of commercial radio revenue and says advertisers still have plenty of choice because radio competes with other media and has just 2.5 per cent of the UK ad market. JCDecaux could make a similar case as outdoor is only 5.5 per cent of the market. Some say it would be good for outdoor to have one strong player because, as in radio, the medium could compete better with the big media owners such as Google, Facebook and ITV. But one of JCDecaux’s rivals asks: "Would outdoor get a bigger share of the ad market or just JCDecaux?" Now it is up to TfL to decide about the Tube. Whatever the outcome, expect more change to be coming down the track.